But before they were expelled from Garden of Eden, God provided them with clothing: “And the Lord God made garments of skin (‘or with an ‘ayin) for Adam and his wife and clothed them” (3:21). There are many interpretation however, as to the garments of skin – the skin of animals as loin covering to protect the sacral chakra, the center of energy life force, while other meaning is a form of pure light – an all seeing eye, shining rays of light, an owr. Adam and Eve had their garments of celestial light replaced by “garments of skin,” which merely protected but no longer illuminated. (Zohar, II, 229a-b). Enoch is the seventh of the ten pre-Deluge Patriarchs. Enoch lived 365 years (3284-3017 BCE) which is extremely short in the context of his peers because he travelled to heaven. These recount how Enoch is taken up to Heaven and is appointed guardian of all the celestial treasures, chief of the archangels, and the immediate attendant on God’s throne. He is subsequently taught all secrets and mysteries and, with all the angels at his back, fulfils of his own accord whatever comes out of the mouth of God, executing His decrees. Enoch was also seen as the inventor of writing, and teacher of astronomy and arithmetic, all three reflecting the interpretation of his name as meaning initiated. Much esoteric literature like the 3rd Book of Enoch identifies Enoch as the Metatron, the angel which communicates God’s word. Methuselah lived 969 years (Genesis 5:27), longer than anyone else recorded. His father was Enoch. Methuselah, meaning “God sent Death”, a communication (Gemini} by God that he will send death to earth by means of flood. After the flood, Noah began farming and engaged in vine growing. He planted field of grapes and produced wine. One day when Noah was drunk, his youngest son Ham stole those garments of skin and hid them from his brothers who covered the nakedness of their father. Another, while in Noah’s house, Ham fathered a son Canaan as a result of sexual act committed to Noah’s grand daughter in law Rasueja, the wife of Arphaxad. The Book of Jubilees. Because adultery is strictly forbidden in Holy Scripture and punishable by law of God with death by stoning, this illegitimate son Canaan was cursed into slavery by Noah. Noah died 350 years after the flood, at the age of 950, the last of the extremely long-lived antediluvian Patriarchs. The maximum human lifespan, as depicted by the Bible, diminishes rapidly thereafter, from almost 1,000 years to the 120 years of Moses. Cush was the eldest son of Ham. He was the brother of illegitimate Canaan (land of Canaan), Mizraim (Egypt) and Phut (land of Libya), and the father of the Biblical Nimrod. Ham gave the garments to his firstborn son Cush, who kept them for a long time in secret, not telling anybody about them. But Cush (in his older days) took himself yet another wife and by her, Cush got Nimrod, who became Cush’s favorite son. When Nimrod had reached manhood, Cush gave him these clothes and thus Nimrod got even more powerful. Nimrod was the son of Cush, making him the great-grandson of Noah. The bible described him as the king of Shinar (Assyria/Mesopotamia), cities of Babel, Erech and Accad , and was “a mighty hunter who was rebellious against God. Nimrod claimed his kingship on the ground of victory over his enemies by possessing “the garment of skin of Adam and Eve.” It was by virtue of owning this garment that Nimrod was able to claim power to rule over the whole earth, and that he sat in his tower while men came and worshiped him. He was blessed as to the kingship but cursed as to the priesthood. One of the most important persons at Nimrod’s court in Ur of the Chaldees in Babel, or Babylonia, was Terah, the son of Nahor, a great-great grandson of Eber. Terah had three sons, Abraham, Nahor, and Haran. The night before Abraham was born, Nimrod’s astrologers were gathered at Terah’s house. Looking out into the night sky, they read in the constellation of the stars that the newly born child was to become the chief and the father of a mighty nation. This discovery was communicated to Nimrod, who became afraid that the new star might darken his own. Nimrod asked Terah to bring the newly born baby to the palace to be killed. Terah tried to talk Nimrod out of it, but he couldn’t. He risked his life and the lives of his whole family, and exchanged his son with a servant’s child born the same day as Abraham. Nimrod did not suspect the ruse, and he killed the baby with his own hands. Meanwhile, Abraham was hidden in a cave. Abraham stayed in the cave until he was ten years old. During this time he came to believe in the existence of G‑d through reasoning. Abram had watched the sun and the moon and the stars coming and going, each in its own time. He had noticed the sun giving way to the moon, despite its apparent divine power, and the moon giving place to the sun in the morning. And so he reasoned that there must be a Power above and beyond all the visible forces of nature, a Power Who had created them, and Who regulated and controlled them at all times. Behind the limited power of all nature, young Abraham perceived the unlimited and timeless existence of G‑d. Then G‑d made Himself known to Abram and taught him the right way of living. Later Abram went to the house of Noah and Shem. There he stayed many years; there he studied and learned to serve God. Nimrod had long forgot then the threat of the new star which his astrologers had predicted. He had rewarded Terah for his faithfulness and had given him even higher honors than before. Terah was clever, and Nimrod took his advice in matters of state. Besides, Terah had always appeared an obedient servant with regard to the new idols Nimrod introduced in his empire. Nimrod had no reason to hold any grudge against Terah, in spite of his astrologers’ predictions. One day, Abraham took an axe and destroyed all his father’s idols. Only the largest remained intact. When Terah saw his idols shattered and scattered all over the floor, he accused Abram. But Abram said that the largest of the idols had killed all the others in a fight over an offering brought to them. Terah exclaimed that such a thing was impossible, since idols could not quarrel or fight. Then he realized that his son tricked him into admitting that the idols made of stone and wood could not even move, and he became very angry. Forgetting that he had long ago deceived Nimrod by substituting another child for Abraham, he went to the king and reported his son’s irreverence towards the gods. Nimrod had Abraham thrown into prison and condemned to death by fire. Hundreds of people crowded to watch the son of Prince Terah burn alive for disloyalty and disrespect towards the gods. For three whole days and nights, hundreds of people could hardly believe their eyes, seeing Abraham walking in the midst of the flames, without having even a hair of his head burn. King Nimrod himself had to admit that Abram had spoken the truth and that he was a man of God. He asked Abram to come out of the furnace. Nimrod then gave Abram many presents and sent him back to his father’s house. But Abram did not go alone. For with him went two hundred men of noble descent, amongst them, Eliezer of Damascus, who was later to become Abraham’s most trusted servant. They all abandoned Nimrod and his rich court to live with Abraham and learn from him the knowledge of the true G‑d. Abraham married Sarai. He lived with Terah until Nimrod sent for him again, this time intending to kill him secretly. But Abraham learned of this plot in time, and escaped to Noah’s house, where he had lived as a young man. Terah followed him there, and together they went to Haran in Aram Naharaim, or Mesopotamia. He and Sarai were growing old and longed for a child. When Abraham reached his eighty-fifth birthday, Sarai asked him to marry her maid Hagar. Hagar, prior to becoming Sarai’s maid was a princess in Pharaoh’s house, she preferred to be a maid in Abraham’s household. Abram accepted Sarai’s advice and took Hagar as wife. She bore him a son, who he called Ishmael, “G‑d will hear.” When Abraham was one hundred years old and his wife ninety, Sarah gave birth to son Isaac. Isaac was 37 years old when he married Rebecca. Twenty years had passed since Isaac’s and Rebecca’s marriage, but as yet, they had not been blessed with children. Finally, G‑d answered Isaac’s prayers, and Rebecca gave birth to twins. The first child to be born was covered with hair like a fully grown person. His parents called him Esau (from the Hebrew word “osso” — finish). The second child followed Esau, holding on to his brother’s heel, and Isaac called him Jacob (Yaakov, “One that takes by the heel”). Although the children were twins and grew up together, they displayed a difference in character. Jacob spent all his time at home, engaged in study with his father and grandfather Abraham. Esau, however, resorted to countless tricks to avoid studying, and spent most of his time in the fields. He enjoyed hunting and killing, and was often absent from his home for many days. Abraham lived to a ripe and happy old age, and died at the age of one hundred and seventy-five. His sons, Isaac and Ishmael, buried him in the Cave of Machpelah. On the day of Abraham’s death, Esau had been out in the fields as usual. He had lost his way and was trying to find his way back, when King Nimrod arrived with two servants. Esau hid behind a rock, and when Nimrod was left unguarded, he killed him and fought the two servants who rushed to the aid of their master. Esau escaped with King Nimrod’s clothes. These were Adam’s garments which later became the property of Noah; Noah’s son Ham, who was Nimrod’s grandfather, had subsequently become their owner, and finally Nimrod had acquired them. These divine clothes had made Nimrod a powerful and skillful hunter and a mighty ruler over all other kings. Now Esau had come into possession of the most valuable and cherished property a hunter could desire. The birthright was a sacred privilege enjoyed by the first-born son. This privilege made the first-born the real heir and successor to his father, as the head of the family. Isaac’s first-born son was to be devoted to the service of G‑d and to the sacred traditions of the family. But in the case of Esau, it soon became apparent that he was not the one to fulfill this sacred duty. Esau did not wish to shoulder this responsibility, preferring a happy and carefree life as a hunter and man of the fields. Jacob, on the other hand, seemed the ideal inheritor and successor. The day that Esau returned from that fateful hunting trip, his clothes still covered with the spatter of mud and blood, Jacob rebuked him for neglecting his holy duty as first-born. Esau, however, ridiculed Jacob and spoke very mockingly of the birthright. Jacob was shocked to hear such abuse of, and disrespect towards, the sacred privilege of the first-born, and proposed to buy the birthright from Esau who willingly agreed to make the deal. Thus Jacob came into the possession of something he cherished more than all the treasures of the world. Esau is considered to be a rebellious son who kept a double life until he was 15, when he sold his birthright to Jacob. According to the Talmud, the sale of the birthright took place immediately after Abraham died. The Talmudic dating would give both Esau and Jacob an age of 15 at the time. The lentils Jacob was cooking were meant for his father Isaac, because lentils are the traditional mourner’s meal for Jews. On that day before returning, in a rage over the death of Abraham, Esau committed five sins; he raped a betrothed young woman, he committed murder (Nimrod), he denied God, he denied the resurrection of the dead, and he spurned his birthright and giving up the garments of skin obtained from Nimrod. Jacob’s twelve sons, named in Genesis, were Reuben, Simeon, Levi, Judah, Dan, Naphtali, Gad, Asher, Issachar, Zebulun, Joseph, and Benjamin. His only daughter mentioned in Genesis is Dinah. The twelve sons became the progenitors of the “Tribes of Israel”. The biblical Joseph was the 11th son of Jacob. He was born to Jacob’s favorite wife, Rachel, in Paddan-Aram after she had been barren for seven years. Joseph fathered two of the twelve tribes of Israel: Ephraim and Manasseh. At the age of 17, Joseph was a shepherd alongside his brothers. Jacob loved Joseph more than he loved his other sons. Joseph would report his brothers’ misdeeds to his father and Jacob gave Joseph a “coat of many colors.” The other brothers were jealous of Joseph and hated him. Joseph only further provoked this hatred when he told his brothers about two of his dreams. In the first, sheaves of wheat belonging to his brothers bowed to his own sheaf. In the second, the son, moon, and 11 stars bowed to him. One day, Jacob sent Joseph to Shechem to check on his brothers. Joseph went to Shechem and, when his brothers were not there, followed them to Dothan. When the brothers saw him, they plotted to kill him and throw him into a pit. The oldest brother, Reuben, suggested that they merely throw Joseph into the pit, so Reuben could secretly save Joseph later. When Joseph approached, the brothers took his coat and threw him into the pit. They sat down to eat and saw a caravan of Ishmaelite traders from Gilead in the distance. Judah came up with the idea to sell Joseph into slavery. Joseph was sold for 20 pieces of silver. The brothers then dipped his coat into the blood of a slaughtered goat and brought it back to Jacob. Jacob recognized the coat and concluded that a beast had killed his son. He mourned for many days and was inconsolable. Meanwhile, the traders took Joseph down to Egypt where Potiphar, an officer and head of the kitchen of Pharaoh, bought him. Joseph was successful there and Potiphar made Joseph his personal attendant, putting him in charge of the entire household. Joseph was well built and handsome and after some time Potiphar’s wife tried to seduce him. She approached Joseph day after day but he refused her each time, citing loyalty to Potiphar and to God. One day, Joseph came into the house to work. Potiphar’s wife grabbed his coat and he ran away. She then pretended that Joseph had tried to seduce her and slandered him first to her servants and then to her husband. Potiphar was furious and sent Joseph to a jail for the king’s prisoners. In prison, the chief jailor liked Joseph and put him in charge of all the other prisoners, including Pharaoh’s butler and baker. One night both the butler and the baker had strange dreams. Joseph interpreted the dreams, saying that in three days time the butler would be recalled to his former position while the baker would be killed. Sure enough, three days later, Pharaoh restored the butler to his job and killed the baker. Joseph asked the butler to mention his name to Pharaoh in the hope that he would be freed, but the butler forgot about Joseph. Two years later, Pharaoh himself had two dreams that his magicians could not interpret. The butler then remembered Joseph and told Pharaoh about him. Pharaoh sent for the 30-year-old Joseph. He appeared before Pharaoh and told him in the name of God that the dreams forecasted seven years of plentiful crops followed by seven years of famine. He advised Pharaoh to make a wise man commissioner over the land with overseers to gather and store food from the seven years of abundance to save for the years of scarcity. Joseph’s prediction and advice pleased Pharaoh and he made Joseph his second-in-command. He gave Joseph his ring and dressed him in robes of linen with a gold chain around his neck. Pharaoh gave him the Egyptian name Zaphenath-paneah and found him a wife named Asenath, daughter of Poti-phera the priest of On. Joseph traveled throughout Egypt, gathering and storing enormous amounts of grain from each city. During these years, Asenath and Joseph had two sons. The first Joseph named Manasseh, meaning, “God has made me forget (nashani) completely my hardship and my parental home” (Genesis 41:51). He named the second son Ephraim, meaning, “God has made me fertile (hiprani) in the land of my affliction” (Genesis 41:52). After seven years, a famine spread throughout the world, and Egypt was the only country that had food. Joseph was in charge of rationing grain to the Egyptians and to all who came to Egypt. Once Jacob was dead, the brothers were scared that Joseph would take revenge on them for selling him. They sent a message to Joseph saying that before his death Jacob had instructed them to tell Joseph to forgive them. They then offered to be his slaves. Joseph reassured them, saying that God intended for Joseph to go down to Egypt to ensure the survival of many people, and Joseph would take care of them and their children. So Joseph, his brothers and his father’s household remained in Egypt. 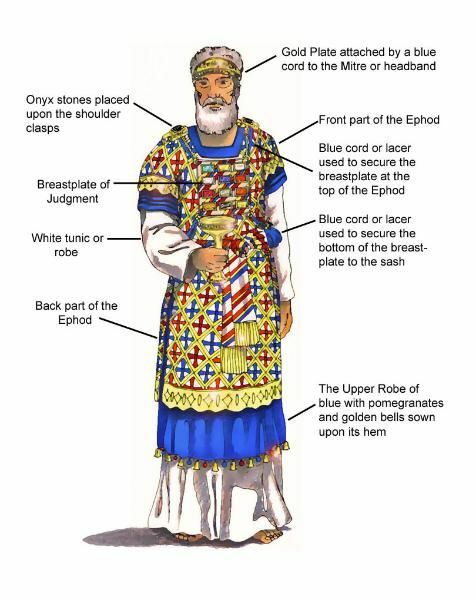 The most important garment worn by the High Priest is the ephod. Its appearance can be likened to an apron; it was worn in back, on top of his other garments, and was fastened by a long belt in the front, opposite his heart. This belt was woven into the entire length of the ephod’s upper hem. There were also had two shoulder-straps that were sewn onto the belt. These straps went behind, up and slightly over the upper corners of the garment, over the priest’s shoulders. The settings for the two sardonyx stones were attached at the ends of these straps, on the shoulders. The Tribe of Levi is one of the tribes of Israel, traditionally descended from Levi, son of Jacob, making up the genealogies of the high priest of the Israelites. When Joshua led the Israelites into the land of Canaan (Joshua 13:33), the Levites were the only Israelite tribe that received cities but were not allowed to be landowners “because the Lord the God of Israel Himself is their inheritance” (Deuteronomy 18:2). The Tribe of Levi served particular religious duties for the Israelites and had political responsibilities as well. In return, the landed tribes were expected to give tithe to the Kohanim, the priests working in the Temple in Jerusalem, particularly the tithe known as the Maaser Rishon. The Levites who were not Kohanim played music in the Temple or served as guards. Notable descendants of the Levite lineage according to the Bible include Miriam, John the Baptist, Samuel, Ezekiel, Ezra, and Malachi. The descendants of Aaron, who was the first kohen gadol, high priest, of Israel, were designated as the priestly class, the Kohanim. The Gospel of Luke adds an account of John’s infancy, introducing him as the miraculous son of Zechariah, an old man, and his wife Elizabeth, who was unable to have children. According to this account, the birth of John was foretold by the angel Gabriel to Zechariah, while he was performing his functions as a priest in the temple of Jerusalem. Since he is described as a priest of the course of Abijah and Elizabeth as one of the daughters of Aaron, this would make John a descendant of Aaron on both his father’s and mother’s side. Others believed it was the same garment that Herod and later the Romans put under lock and key when they wished to prevent the people from putting it on a candidate of their own choice, and tell how the Jews tried to seize the garment by force and put it on John the Baptist, thus making him, instead of Herod, their high priest. Whatever its origin, the wearing of a garment of repentance, symbolic of life of man in his fallen state, was known to the most ancient Christians and practiced by certain ultra-conservative cults down to modern times. The Knights Templar were the guardians of the great Christendom during the pilgrimage years commissioned by Rome as Poor Soldiers of the Knights of the Temple. The order of knighthood was officially recognized by the Pope as inspired by the foundation of the Order of the Hospital of St John of Jerusalem which were created to shelter and give medical help to pilgrims in the Holy Land. The Knights Templar were, quite literally, warrior monks – men who had taken holy orders and monastic vows but who were also trained in the arts of war. When not fighting, a Templar lived a life similar to that of any other monk. When he joined the Order he took vows of poverty, chastity and obedience, wear the Knights Templars’ uniform – a white mantle and cloak (derived from the white habits of the Cistercians). Later the distinctive red cross (the croix pattée) was added to the mantle. It was upon their search under the temple of King Solomon that they uncovered sacred relics, documents about the identity of St. John the Baptist, Mystery of Jesus Christ, Mary Magdalene and other secrets connected to Gnosticism which they concealed in Baphomet , a word from Bap – tist of Wisdom, or Sophia. Baphomet’s name literally means “wisdom” in Aramaic, if run through the ancient Atbash cipher that was often used by the Templars. The result is “Sophia,” which was the name used for the goddess of wisdom, who was often revered in Gnostic cults in New Testament times. It was believed in these cults that one could unite spiritually with Sophia by performing certain rites and meditations, and thus one could obtain “gnosis,” or divine knowledge. Gnosticism was widely practiced in the Roman Empire during Christ’s time. One man widely believed to have been a Gnostic was John the Baptist, the prophet of the New Testament who announced the coming of Christ. John was, after his death, himself revered by a number of Gnostic cults. There were even, by medieval times, numerous underground “Christian” sects called “Johannites,” who believed that John was the true Messiah. Johannite cults even exist today in the form of semi-Islamic Gnostic sects found in Iraq. It has been charged that that Templars followed this doctrine, and indeed, he was their patron saint, as he is now for Freemasonry. More importantly, perhaps, he is known to have been beheaded at the Temple Mount in Jerusalem, and his head, or skull, has become a central Christian icon. This brings into focus the claim of occultist Aleister Crowley that the name “Baphomet,” by itself, without running it through any ciphers, means “Baptist of Wisdom.” This could easily have been a title for the prophet John. Mandaeism like the Johannites religion believe Jesus Christ as a man never existed. Mandaeans recognize several prophets. Yahya ibn Zakariyya, known by Christians as John the Baptist, is accorded a special status, higher than his role in Christianity and Islam. Mandaeans do not consider John to be the founder of their religion but revere him as one of their greatest teachers, tracing their beliefs back to Adam. Mandaeans maintain that Jesus was a “false messiah”. The Mandaic word k(a)daba, however, might be interpreted as being derived from either of two roots: the first root, meaning “to lie,” is the one traditionally ascribed to Jesus; the second, meaning “to write”, might provide a second meaning, that of “book;” hence some Mandaeans, motivated perhaps by an ecumenical spirit, maintain that Jesus was not a “lying Messiah” but a “book Messiah”, the “book” in question presumably being the Christian Gospels. However, this writer personally believes that Jesus Christ is a true God in oneness with the Heavenly Father manifested by the Word of the Gospel according to the prophesied Messiah of the Age of Pisces (qualities of sacrifice, selfless love to humanity). He was born out of logos and wisdom from God as dictated to the Christian writers and historians. 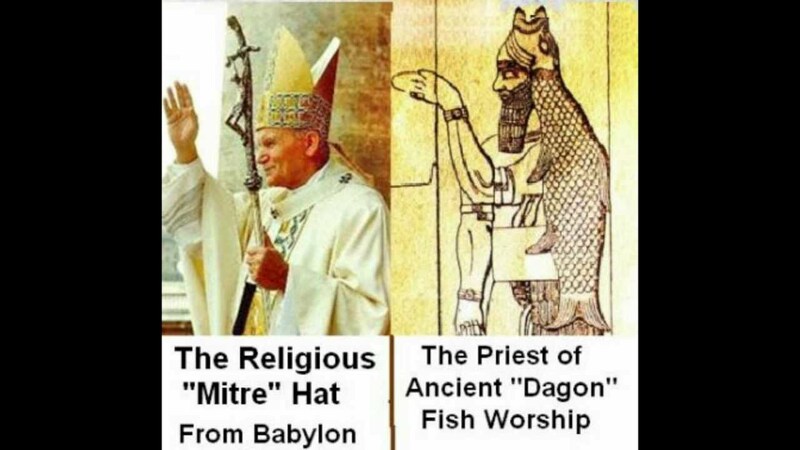 The garments of skin Adam and Eve, once the tunic coat and mantle of the legend Knights Templar are now part of the uniform of the Catholic Bishop of Rome, the Soldier of Christ but combined with the mitre or headress of dagon priest of Babylon, the symbol of the Age of Pisces (fish). Aquarius is all about making the world a better place. Having a strong social conscience, combined with a innovative, visionary intelligence, compassionate and caring, but also eccentric and unbound by convention. Aquarius values progress and technologies that can revolutionize the world. Aquarius is an airy, scientific, and intellectual sign, it is a forgone conclusion that the religion of that Age must be rooted in reason and able to solve the riddle of life and death in a manner that will satisfy both the mind and the religious instinct. Age of Aquarius is the age of enlightenment. 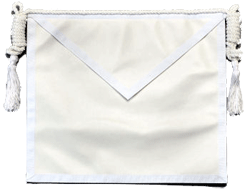 The ‘garments of skin’ of the Freemasons is the lambskin or white apron. The lambskin apron was commonly used by workmen at the building of King Solomon Temple to protect the clothes from soil, but as we progress our studies and understanding about the nature of God, we can consider ourselves as High Priest of the Temple of Israel, the mediator between man and God , the duties belong to the tribe of Levi which we are now trying to emulate the wisdom, morality and philosophy of the ancient. Note: The opinions expressed in this article are the author’s own and do not reflect the view of his organization or affiliation and membership. Gabriel Comia, Jr. is a student of metaphysical science, esoteric, gnosticism; a former member of Ministers of the Holy Eucharist in St. James the Greater Parish Ayala Alabang Village, and former member of Couples for Christ.